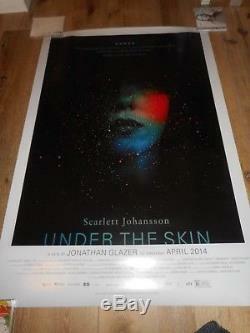 For sale is this original double-sided rolled poster for UNDER THE SKIN from 2013. 27" x 40" and is in good condition with some surface and edge wear. The poster will come double-tubed. The item "UNDER THE SKIN ORIGINAL DOUBLE SIDED ROLLED POSTER 2013 SCARLETT JOHANSSON" is in sale since Wednesday, March 28, 2018. This item is in the category "Entertainment Memorabilia\Movie Memorabilia\Posters\Originals-United States\2000-Now". The seller is "mr-bigscreen" and is located in Los Angeles, California. This item can be shipped worldwide.